I really wanted to make a gingerbread house with the little miss this year. The problem? Well, I didn't want to start with an already made kit that you just assemble and with my ever growing cookie-to-bake list I didn't want to make it myself. Then I discovered graham cracker houses. Where have I been? I'm convinced I've never seen this idea before until I googled holiday crafts to make with your toddler. My babysitter (who is 15 years younger) tried to convince me that we made them in school. Ha! Did 'we'?! I don't remember that. Anyway, countless pictures and instructions are available just a few clicks away. I'm really into the small scale and although Clementine's two year old hands couldn't assemble a cottage, she was very happy to decorate the roof with peppermints and make a snowman out of mini marshmallows all while singing her rendition of Frosty. 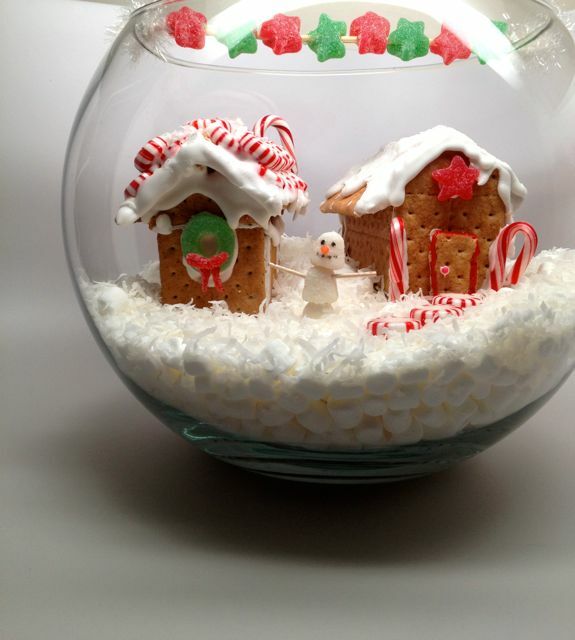 Putting our sweet, snow covered houses in the punch bowl seemed like a great way to contain them in our own little snowglobe. I filled it with giant marshmallows and then mini marshmallows (are you singing 'It's a marshmallow world in the winter when the snow comes to cover the ground... It's a time for play, it's a whipped cream day... I wait for it the whole year round' ??? I am.) put in our cottages and then sprinkled with coconut. 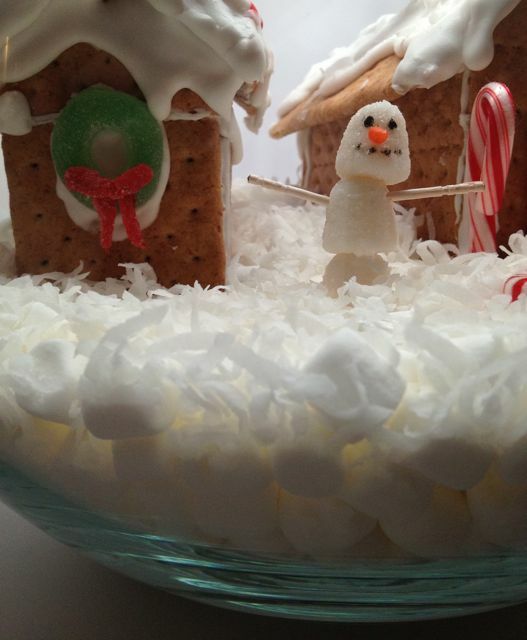 A gumdrop snowman and peppermint walkway were the final touches. Oh, and of course the string of star 'lights' across the top, for this is a festive peppermint town! It's simple and not perfect, and that's what I love about it. As for the mini marshmallow snowman that Clementine made? She ate it, of course!